W Times Square is in the heart of the theatre district, with museums a few blocks north and sultry downtown a quick subway ride away. It offers a modern and contemporary design with comfortable size rooms and wonderful amenities. 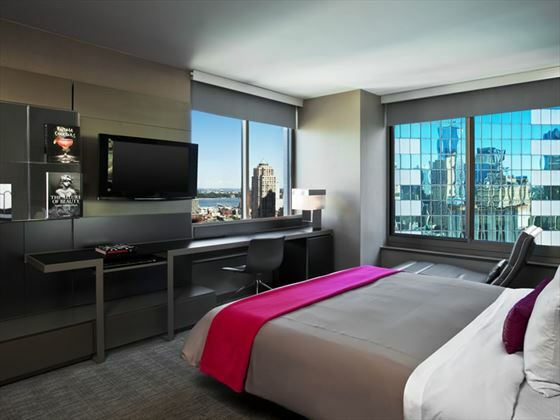 507 guestrooms and 43 suites offer breath-taking skyline views with chic interiors and plush furnishings with an onsite fitness centre and full-service business centre. W New York- Times Square is situated in a prime location, in the heart of the theatre district and just a mile from the Empire State Building and the Rockerfella Centre. Dos Caminos- Lively mexican restarant boasting a 40-seat mezcal and margarita bar, DJ and private dining, enjoy the finest dishes in the two-floor rustic-style restaurant. Reservations required. The New Yorker, A Wyndham Hotel is 2 minutes walk from Madison Square Garden and opposite Penn Station. It offers free Wi-Fi access and rooms with a flat-screen cable TV with premium channels. Times Square and the Theatre District are 10 minutes walk away.